American Brag: A game where the player who raises the hand would show the first player who calls his hand and the one with the worst hand would have to fold. Bet or Get: A rule in a game where a player has to either place a bet or has to fold the hand without checking (Bet or Drop, Passout). Check Raise: In the same betting round when a player first checks and then raises. 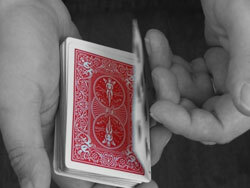 Deep Low: The lowest possible hand for any given card (i.e., a deep seven would be ace, two, three, four, seven). Foiling the Cut: A method used by a cheating player of returning cards to their original place after making a cut. Hold Out Device: A mechanical device which is used by cheating players to hold out cards (Refer to Bug, Lizard, Spider). Ideal Edge Odds: In theory the maximum edge odds which are not possible to achieve. Live: A live player is one who is expected to lose chips at a very good rate. " Over Button: Players can take the over buttons which would mean they're ready to play for higher stakes. Restraddle: The third blind bet which is double the straddle or the second blind bet. Table Cards: Cards that are placed face-up on a table for everyone to use in a hand, similar to Cincinnati. Time Cut: Money which is charged from every player in a poker club or a casino based on predetermined time. Generally the charge would be fixed on a per hour basis or even on a three minute time period. (Axe, Collection). 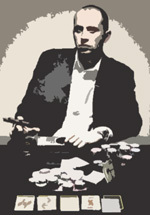 Two Pair Nine: A Stud poker or a draw split-pot poker where a nine is considered as low and two pair are taken as qualifiers for a high hand. These games are generally played with one or two twists. Value: Value refers to the return a player would get on their equity in the pot as compared to the size of his bet or raise. Waving: Coiling or crimping the cards by a cheating player so that the card could be spotted in an opponent's cards or in the deck.